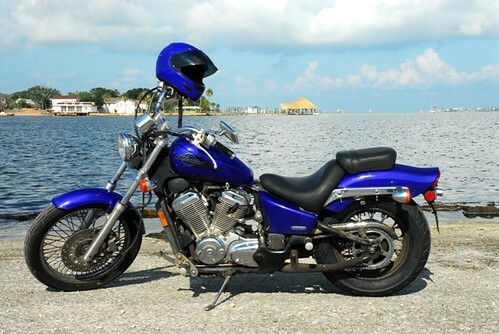 I have my own personal Fountain of Youth, and it's name is Honda Shadow 600. When I'm sitting on the couch reading the newspaper or watching reruns of whatever came in the mail from Netflix this week, I feel old. When I'm sitting on the saddle of my bike watching the countryside zoom by, I feel young again. When I see photographs of me that show my apparent bald spot, I feel much older than I should. When I see photographs of me on my bike, wearing a bald spot-covering helmet, I feel young again. When I'm sitting behind the wheel of my 9-year-old sedan, heading off to Wal-Mart to pick up a loaf of bread, I feel old and decrepit. When my hands are gripping the handlebars of my Shadow, heading wherever I want to go, I feel as young and free as a child on his first bicycle. When I'm pumping gas into that old sedan, I imagine the people around me thinking, "I'm never going to be so old that I have to drive something like that." When I'm pumping gas into my motorbike, I imagine the people around me thinking, "I want to be just like him. And when I save up some money, I'm getting a bike just like that." People on motorcycles always look like they're on an adventure, heading to places others only dream of, having the time of their life. ...up until we get splattered across the road by some stupid 18-wheeler. It's a lot easier to go to different places with a big bike. You can feel the wind as you ride along as well.